Natural antioxidants in honey. Do we really need antioxidant supplements? Are antioxidants really good for us? Which are the best: from supplements or from food? Does honey have antioxidants? This article will cover all these and much more. There is a whole new obsession with antioxidants. There are tons of supplements with antioxidants. Naturopathic doctors, as well as medical doctors, tell us to take antioxidants as our body needs them. I think my question here is quite legit: Why? My grandmother did not take them and she is 96 years old (now, in 2016). Her mother didn’t take antioxidants and she reached 101! Why do we need antioxidants now? Doctors will say that our stress level has increased a lot during the latest decades and so are the pollution. I agree with the pollution, but I don’t know about the stress. I mean, stress can be generated even by the smallest and insignificant things. It’s only a matter of attitude in how to handle it. But if we consider the pollution and all radiation sources around us, plus some X-Rays that we must do for the diagnostic purpose, and, the less-healthy food we had to eat, than maybe we need to adjust to the times and support our body with some more vitamins. Let’s see what’s oxidation first. Oxidation is a chemical reaction that can produce free radicals, leading to chain reactions that may damage cells. Antioxidants (like vitamin C) terminate these chain reactions. Ironically, while we cannot live without oxigen, inside our body oxygen is a highly reactive molecule that damages living organisms by producing reactive oxygen species. What are these? Reactive Oxigen Species, aka ROS, are chemically reactive molecules containing oxygen, formed as a natural byproduct of the normal metabolism of oxygen and have important roles in cell signaling and homeostasis. So far so good. But, under too much stress (like UV radiation, X-rays or gamma-rays exposure, ionizing radiation), levels of ROS may increase dramatically and this damages the cell structure. This is called “oxidative stress”. ROS can damage cellular proteins, lipids and DNA, leading to fatal lesions in cell that contribute to carcinogenesis. What happens to cancer cells? – at high levels, ROS can suppress tumor growth through the sustained activation of cell-cycle inhibitor and induction of cell death as well as senescence, by damaging macromolecules. What’s the relation between physical exercise, ROS and cancer? Should we take antioxidant supplements? It’s hard to remain sane and healthy when we are surrounded by so much cancer and other diseases. And it’s even more hard to remain sane and healthy with so much pharmaceutical advertising around. There are psychotherapists telling that all these ads, being repeated so often would enter our subconscious mind directly, making us believe that we will never get better unless take that specific medicine. And so, we take antioxidants. To prevent a disease. But we forget the most important thing ever: Our body is a highly intelligent organism, which functions by its own, without our intervention. In each and every moment of our lives, we have cancer cells in our body and they are destroyed by it. Our body is never in a perfect state of health, but in a balance which includes good and bad. We may have cancer in a beginning form, in any moment, but it is asymptomatic in this stage, and then our body can destroy it just like that, without our awareness. If we are in this point and take antioxidant supplements, we may prevent the body from healing itself. Because we will prevent the formation of ROS, which are needed in large quantities to destroy the cancer cells. 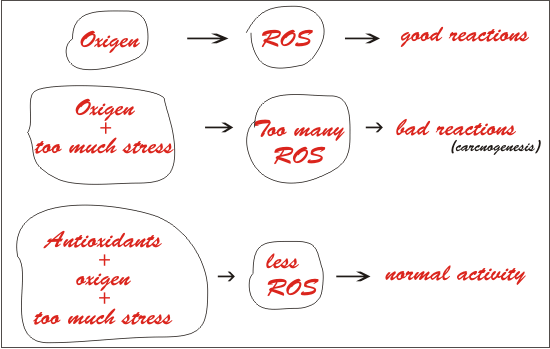 If we are having a cold (which is a stress for the body) or are under mental/emotional stress we need antioxidants to stop the formation of too many ROS that would lead to aging and chronic diseases. But if you already know yourselves with cancer or are not yet diagnosed, then antioxidants will prevent our body’s natural reaction of fighting with it. This is what recent studies say: DO NOT TAKE antioxidants in cancer! Yet, let’s not get paranoid and let’s not prevent anything. Let’s only trust our body, love it and thank it. And supply it with natural food so it an take whatever needed from there. It is the most complex thing on this world, that knows better how to take care of itself. Only stick to a balanced diet, physical exercise and peaceful thoughts. Our body knows how to take its antioxidants from the food. Antioxidants can be of 2 types: soluble in water and soluble in lipids (fat). Some can be produced by our body, but some not and our diet should include them. Here are some of them: Vitamin C, Selenium, Zinc, Glutathione, Lipoic acid, Uric acid, β-carotene, Retinol (vitamin A), α-Tocopherol (vitamin E), Ubiquinol (coenzyme Q), Superoxide dismutase, Catalase and Peroxiredoxins and others. Do antioxidants have bad side-effects? According to Bjelakovic G et al. in their study “Mortality in randomized trials of antioxidant supplements for primary and secondary prevention: systematic review and meta-analysis” and Ristow M et al in the study “How increased oxidative stress promotes longevity and metabolic health: The concept of mitochondrial hormesis (mitohormesis)”, some antioxidant supplements may promote disease and increase mortality in humans under certain conditions. Oxidation leads to free radicals (blamed for our aging). Antioxidants prevent the presence of free radicals. BUT, scientists tell us that, hypothetically, free radicals induce an endogenous response that protects against exogenous radicals (and possibly other toxic compounds). This increase may be prevented by antioxidants, providing direct evidence that toxic radicals may mitohormetically exert life extending and health promoting effects. Conclusion? Antioxidants are not that good. Free radicals may increase life span. Personal conclusion: take your antioxidants from the food you ingest, not from supplements. Coming from food, our body knows what to keep and what to reject. Honey does not have huge quantities of antioxidants, but they are in the right proportions and perfectly suited for our body. Although the antioxidant activity of honey has been extensively studied, scientists have not yet agreed and understood it. This happens because honey is such a very complex mixture, containing ingredients involved in both “oxidant/antioxidant” physiological processes. Among them: hydrogen peroxide, nitrite, nitrate, glucose, glucose oxidase, iron, copper, chlorine, iodine, catalase, tyrosine, tryptophane, arginine, flavonoides, phenolics acids, Maillard reaction products, its pH is not stable etc. There are more antioxidants in honey then in tomatoes or sweet corn. The antioxidants present in honey (4.32 x 10-³ mEq) exceed the levels of antioxidants existing in tomatoes (2.83 x 10-³ mEq) and sweet corn (1.36 x 10-³ mEq). Dr May Berenbaum, head of University of Illinois Entomology Department says: “Gram for gram, antioxidants in buckwheat honey equal to those of fruits and vegetables.” Although the serving size is much smaller. Are Antioxidants the same in all honeys? The antioxidant content depends on several factors: the species of bee, botanical source, season, weather, environment and processing methods. Depending on the type of honey, the antioxidant content can range from 56 to 500 milligrams of antioxidants per kilogram of honey. According to National Honey Board, in a study made in 2011, the water soluble oxidant content of the honey samples varied more than 20-fold, from a high value of 4.32 x 10-³ Eq for Illinois buckwheat honey to a low value of 21.3 x 10-5 Eq. for California buttom sage honey. Dark-colored honeys have higher antioxidant activities than light-colored honey. The study Antioxidant activity of Portuguese honey samples: Different contributions of the entire honey and phenolic extract, by Isabel C.F.R. Ferreira et al., showed that darker honeys have more antioxidants than lighter ones. They used rosemary honey as light honey, viper’s bugloss honey for amber honey and heather honey for dark honey. All from Portugal. 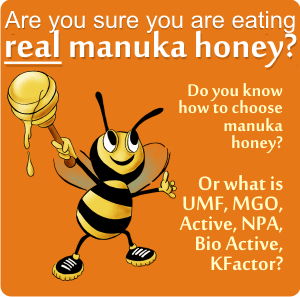 Which are the most powerful antioxidant honeys? The antioxidant properties of honey depend on the botanical origin of honey, the darker the honey the higher its antioxidative power. Polyphenols seems to be the most important antioxidant agent in honey, and dark honey are the ones with the largest quantity of polyphenols . With the exception of some relatively lighter honeys like arbutus honey from southern Europe and sourwood honey from Malaysia. Are antioxidants in honey really making a difference? · Antioxidant scavenging activity is linked to the prevention of many chronic and age dependent pathological conditions like cancer, diabetes, atherosclerosis, cataract and other chronic pathological conditions. · Antioxidant properties of honey act as an antidepressant during high emotional, physical and intellectual stress. For example, Bashkir honey is part of the daily meals of astronauts and it is also used by deep-sea divers. · Researcher Heidrun Gross of the University of California-Davis and his colleagues say that antioxidants are thought to protect humans from disease by slowing potentially dangerous disease processes in the body. The compounds work by scavenging free radicals, unstable compounds that can damage healthy cells and compromise their function. 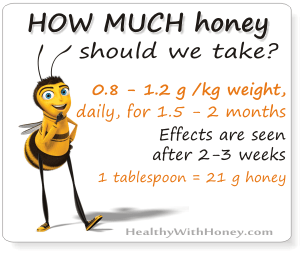 · In a study reported by A-Waili in 2003, people were given daily diet servings of honey of 1.2 g/kg body weight. Compared to sugar control honey increased the antioxidant agents: blood vitamin C concentration by 47%, β- carotene by 3%, uric acid by 12% and glutathione reductase by 7%. 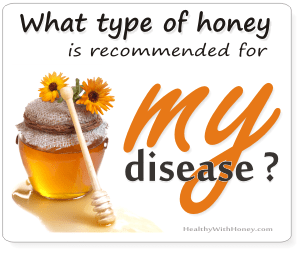 · In another study 25 participants received 4 tablespoons of buckwheat honey daily for 29 days in addition to their regular diets. Two types of honey containing different amounts of polyphenols were tested. Blood samples taken at the beginning and end of the study showed a direct link between honey consumption and levels of disease-fighting polyphenols. The more polyphenol-containing honey they ate, the higher the levels of antioxidants were in their blood. 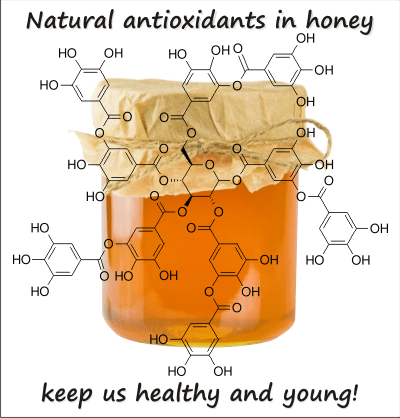 · The study Honey with High Levels of Antioxidants Can Provide Protection to Healthy Human Subjects, by Derek D. Schramm et al., from Departments of Nutrition and Internal Medicine at the University of California, published in 2003, showed that the substitution of honey in some foods for traditional sweeteners could result in an enhanced antioxidant defense system in healthy adults. Is pasteurization and time affecting antioxidants? We find honey in a raw state, meaning exactly how it is harvested from the hive, without being heated (in order to be filtered) or processed in any way. (see What is the difference between pure honey and raw honey?) Or, we can find pasteurized honey, especially in supermarkets. It is pasteurized for an aesthetic reason: to prevent unwanted honey crystal formation, but also to destroy harmful microorganisms. Warning: Dark honey due to pasteurization! During pasteurization, the heat causes a type of browning referred to as the Maillard reaction. The sugars in honey (fructose and glucose) bind to free proteins and form brown-colored pigments called Maillard reaction products. This darkens the honey and also causes losses in the amount of natural honey antioxidants. In 2004, X.-H. Wang of the University of Illinois and others. studied the effects of heat processing on the antioxidants in buckwheat and clover honey. While pasteurization had no effect on clover honey, it decreased the antioxidant capacity of buckwheat honey by approximately one-third compared with raw buckwheat honey. Scientists explained that this may be because different antioxidant structures break down less during pasteurization. Pasteurization increased the levels of quercetin and galangin antioxidants in clover honey, and reduced the amount of galangin in buckwheat honey. Time also influences the antioxidant level. The highest level of antioxidant levels measured in buckwheat honey was immediately after harvest. After six months of storage, the antioxidant capacity of the raw and pasteurized buckwheat honey were similar. Both the phenolic content and the antioxidant capacity of honey decreases significantly after one year of storage at room temperature (Sariq G, 2012). Who studied which are the antioxidants in honey? Ferreres, Tomas-Barberan, Soler, & Garcia-Vigera, 1994; Crane,1975; Frankel et al. 1998; Gheldof et al., 2002; Al-Mamary et al., 2002; Fahey and stephenson 2002; Aljadi and Kamaruddin 2004; Berreta et al. 2005; Blasa et al. 2006; Nagy et al. 2006; Perez et al. 2007; Buratti, Benedetti, & Cosio, 2007 and others. Take antioxidants if you are having a cold or a flue – to boost your immune system. Do not take antioxidants if you are having cancer. The best antioxidants are the ones found in natural food, with that specific food. Honey has the perfect amounts of antioxidants and other substances required for our body. Amazon.com sells a 470 pages book written by Laïd Boukraâ, DVM, MSc, PhD, a detailed compendium on medical uses of honey. The book covers honey’s ethnomedicinal uses, chemical composition, and physical properties but also its healing properties including antimicrobial, anti-inflammatory, and antioxidant properties. The author details the good benefits honey brings to people suffering from gastrointestinal disorders, cardiovascular diseases, diabetic ulcers, and cancers. 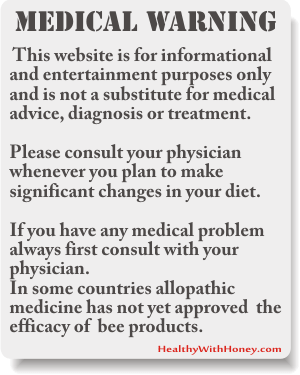 You will also find interesting facts about how to use honey for animal health and wellness. Honey During Storage. Food Technology and Biotechnology 50 (4): 434-441. 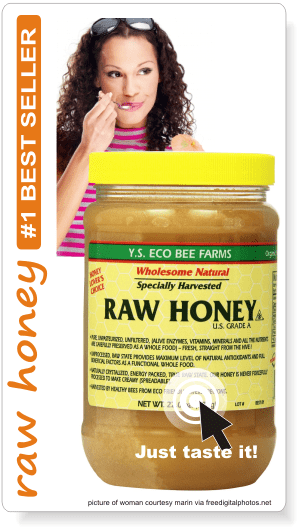 What are the enzymes present in raw honey? Why are they important? Bashkir honey, the most expensive honey in the world, food for astronauts! What a great article! Very well documented, comprehensive, clear, and what matters most for me: honest. And now more to the point: I get my antioxidants from green tea. I love it and I always have a cup first thing in the morning, with honey. And my favorite thing to go next to my cup of green tea is a toasted bagle with cream cheese and honey on top! From the tone of your comment I understand that you enjoy your meal A LOT. That you love those foods and really know they are good for you. Well, I think this is the most important thing: to enjoy what you eat. To love the taste of life. Probably more important than the antioxidants in it. But technically speaking, antioxidants are in green tea as well as in honey. Good choice. Only be careful and don’t put the honey into the tea when it’s too hot. Wait until it’s warm, and then add honey. thank you for your good words of appreciation.